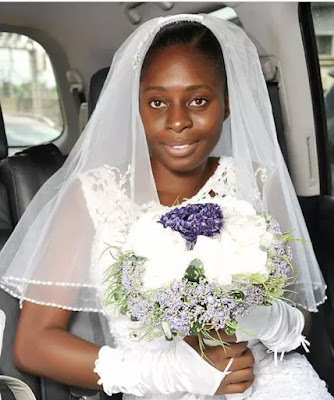 Bisoloa Umoren, a Nigerian bride who broke the net for deciding not to wear makeup on her wedding, has thrown light on why she did it. Bisola, who was initially reported to a be a Ghanaian, said when her husband first saw her, she did not have makeup on and he fell in love with her all the same. She said on the say of the wedding, the photographer and the make-up artist insisted that she “touch up” her face a little, but she refused. Bisola said she was naturally not someone who loved to do makeups. “I don’t even wear earrings or like to drop my hair. I don’t like any form of inconvenience or discomfort on my face, my neck, and entire body. It is not a church thing, it is just me and my personal decision,” she said. She said she had been compelled to put on make-up during the engagement and that she hated herself when she saw how she looked. “I looked darker and older. The whole engagement pictures were nothing to write home about,” she said. Bisola said that convinced herself that she would not use makeup on the wedding day and it turned out good. Her no makeup photo has gone viral across the internet and has received commendation from many people. “I think God just decided to crown me with early morning beauty the day I wedded,” she said.